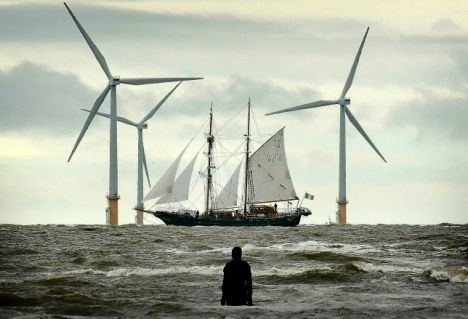 Here’s a dramatic photograph from the The Daily Mail UK (July 19, 2008 ) – The winds of change – the moment a Tall Ship faced up to modern wind turbines. The solitary figure wading out into the sea is actually a sculpture by British artist Antony Gormley who may be most readily known for his monumental sculpture Angel of the North which is celebrating it’s 10th anniversary this year. Gormley was also awarded the Tate Gallery’s prestigious Turner Prize in 1994.